Well, the holidays are over, and we are all trying to clean up our act! Let's take a look at what's in season for January in California to contribute to our detox, de-stress and decrease in size! Asian Vegetables - napa cabbage, bok choy, tat soi, oh boy!! You can find a wide variety of Asian greens at your local farmer's market in January. Asian greens are highly nutritious. Most are excellent sources of Vitamin C and good sources of Vitamin A. They contain many antioxidants and the darker the colour, the higher the antioxidant level. Except for Chinese cabbage, Asian greens are good sources of available iron. Unlike spinach, Asian greens do not contain oxalic acid, which binds iron to the spinach so that it is not available to the body. All Asian greens supply folate and are a good source of fiber. 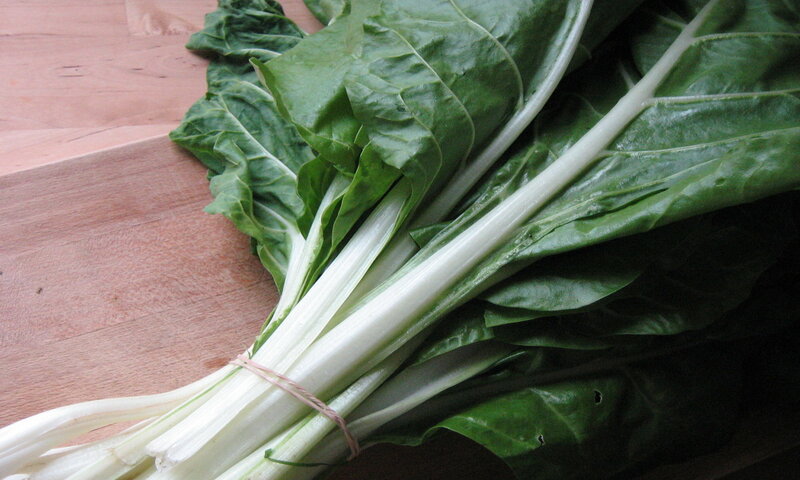 Swiss Chard - chard is a great source of vitamin A, vitamin K, vitamin C and iron! It's also rich in B-complex vitamins, and an important source of minerals. Regular inclusion of chard in the diet has been found to prevent osteoporosis, iron-deficiency anemia, and vitamin-A deficiency; and believed to protect from cardiovascular diseases and colon and prostate cancers. Sounds like a winner to me! Dandelion Greens - these lovelies are loaded with calcium, iron and antioxidants to keep you luscious as long as possible. They also contain loads of minerals, and they're content is a whopping 14% protein! Even more importantly, they're very powerful for detoxification, especially through the liver. Supporting your liver detoxification can make you feel better, make your skin look better and help reduce symptoms of PMS. Yup, I said that... Try them as raw best, so throw them in a salad, or whip them up in your vitamix for a green goddess smoothie. Leeks - leeks have excellent amounts of Vitamin C as well as folate, and useful amounts of B vitamins, Vitamin E, copper, potassium and iron. A range of saponins are present with some flavonoids. Carotenoids and chlorophyll are mainly in the green tops. Leeks are a great addition to a winter soup, or just slice and sauté to join your eggs, or eat as a side dish. They're earthy, sweet and oh so lovely. Shallots - Shallots are related to onions, but they have a sweeter, milder flavor. Like garlic and onions, shallots have dry, papery skins. These flavorful vegetables provide good sources of several important nutrients including iron, vitamins A and C and phytonutrients. Try adding them to your favorite soups, sauces and sautés for a healthy burst of flavor. Grapefruit - a great source of Vitamin A and C and an excellent source of fiber. But that's not all!! Grapefruit contain two main phytonutrients found to help fight cancer. Limonoids, in the flesh of the fruit, are known to stimulate the production of enzymes that help the liver rid the body of toxic substances more easily. Research also has shown limonoids have the potential to fight breast and colon cancer, as well as cancers of the mouth, skin and stomach. Lycopene is a phytonutrient found in the pink and red varieties of the fruit. The antioxidant capabilities of lycopene have been shown to have anti-tumor properties that reduce the risk of some cancers, such as prostate cancer. Please note: consumption of grapefruit is contraindicated with certain prescription medications. If you're concerned, please ask your doctor. No meds, no problems!! Go for the pink and red varieties for extra antioxidants and a bit sweeter flavor. Tangerines - of course, these babies are a great source of immune boosting vitamin C, but they have some other hidden treasure as well. It's known to have a purifying effect, stimulate blood cells to cary more oxygen, and the essential oils have a a relaxing effect on the nerves. Who doesn't need that!? Use the smoothie preset if you have it, or start on low speed until movement is achieved, then turn up to medium high for 10 seconds or until puree perfection is achieved. Enjoy! Slam one of these green beauties for a cold, flu or a nice healthy detox. So good. Enjoy your fabulous new year, and be well!